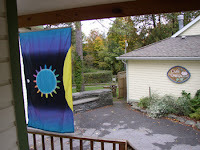 I just got back from the Omega Institute in Rhinebeck, NY. It's a gorgeous campus far far away that is dedicated to all things holistic and spiritual. Last summer I spent a week there learning transcendent drumming with a master drummer, Steve Leicache. Gray is not quite old enough for Little Forest People, so he participated in the childcare program. It's like hippie daycare- they make butterfly mobiles, play in the lake, and today he'll be learning belly dancing. What's so special about Omega is that it's a bit of true community. Sure there's a healthy population of granola girls and tree hugging guys, but there are also very well-respected experts from all over the world who come to give meaningful lessons, healings, and knowledge. This year, I met the Music Doctor. Any time his door was open, you could enter this small sanctuary type of room- you remove your shoes and sit on the the floor. So I walked in, attracted by his gentle voice and ethereal guitar playing. He finished a song he was singing and then looked to me with a smile and said, "What the mood for you today? What's today about?" The point of his question is that he makes original, extremely touching, imagery-laden songs with intent to heal your mind, heart, spirit. Deeply personal stuff- you can tell him anything, and among strangers, you're in a safe place. So, I told him what was on my mind as I look down to notice a mostly-empty box of tissues. Uh oh, here it comes. I told him what was on my mind, succinctly, and he starts retuning his guitar and said, "Well let's see where this song lives." After about a minute of that, he produced a most beautiful, touching song about the things I was thinking and feeling- I was thinking "compassion". Tearing up almost immediately, I let my mind ride the wave of beauty he strummed and it was effortless. After my song, another woman came in. He asked her about what was on her mind and she said, "Oh, it's heavy." "Great," he replied. I guess tragedy makes for good lyrics. She said that her brother had jumped out a window, I guess he committed suicide- she didn't elaborate. She didn't need to. I started crying for her before the song even began! He sang about gravity and matter through space- I felt him feeling her pain with her- we all were. And just as soon as the song ended, it was time for us all to go. That's Omega. Throughout the campus (there are rustic cabins to rent for your week, or you can camp) are people walking with "In Silence" written on cards around their necks- they're in silent retreat. Or there are cairns, or gorgeous art works made from pine cones strewn about the ground. Buddha statues and themes abound. There's the Ram Dass library, in perfect fung shui balance. There are stunning gardens, a breathtaking sanctuary to which one must literally ascend- it's way at the top of a hill and long staircase. There's dawn Tai Chi at the lake, prayer flags waving in the wind, and vegetarian food in the cafeteria with the best coffee you've ever had. People walk barefoot, adorned with smiles and henna. Co-parenting is encouraged- it's not unusual for you to walk someone else's child to their class, or for you to remind someone else's child of the rules. There's a feeling of safety- children wander from the Lake Theatre to the Main Hall, sometimes as night falls, knowing their walk is on a safe pathway among hundreds of friends. At night there's entertainment. Tuesday night was the magic show by Magicians Without Borders, Thursday a world-renowned mask-wearing storyteller. There are child-friendly and parent-entertaining singers- "Bear Cat" is one of Gray's favorite songs. I sat for a long while in the cafe, eating homemade chocolate ice cream and doing some sketching of Solomon's Seal. Random people may come sit with you, or you can join another's game of Scrabble- perhaps they've just finished their class, "Dance of Tennis" or "Being with the Flower". Omega has year-long workshops and facilitators. It's an amazing place and I wanted to share it with you. And I wanted to say thank you to my mother for sharing it with me and our whole family.